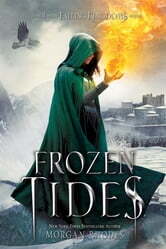 I didn't enjoy Frozen Tides as much as I enjoyed the others. I'd still recommend reading it because it has a lot of important parts to it to set up the ending of the series. My main issue with the book was that the plot was much too slow for me. There was a lot of politics and not enough life or death situations for me. I'm slowly losing interest in the watchers and how the magic is handle in their world. We didn't get much information from the watchers in this book so it didn't feel as important as it did in previous books. I feel a little lost with that whole plot and am more interested in seeing how things play out for the King instead. I also really didn't like Lucia's character in this book. I'm assuming that was done for a reason but I didn't particularly enjoy reading her parts and had to try hard not to skim them. Honestly, I mostly kept reading for Magnus and Cleo because they're the more interesting characters. I'm interested in seeing how things work out at then end for them!